The University of Maine football team (1-2) travelled to Harrisonburg, Va. to take on the reigning national champions the Dukes, from James Madison University (4-0) on Saturday, Sept. 23. Unfortunately, the Black Bears lost a hard fought battle, 28-10 with 25,330 in attendance. In last year’s conference play, UMaine fell short to the Dukes, losing 31-20 at home. The Black Bears won the toss, choosing to kick first. The starting quarterback for James Madison was fourth-year Milford, Pa. native Bryan Schor. Schor was named the Colonial Athletic Association (CAA) Preseason Player of the year and was an All-CAA selection. Starting at quarterback for the Black Bears was a red-shirt first-year from Fort Washington, Pa. Chris Ferguson. Ferguson has started all three games this season. After 15 minutes of play, the game remained scoreless. It was the first time since November 2015 that the Dukes have failed to score in first quarter. James Madison led Maine in passing yards, 61-32. The Dukes also led the Black Bears in rushing yards, 22-11. Both teams finished the quarter with one turn over. It was a great start for Maine third-year linebacker, Sterling Sheffield, from Mullica Hill, N.J., who notched his third career interception and eighth career sack. In the second quarter, Schor completed a pass to fourth-year tight end Jonathan Kloosterman from Strasburgh, Va. for an 11-yard touchdown. Fourth-year kicker Tyler Gray from Winchester, Va. then completed the extra point conversion, making it 7-0 James Madison. At the end of the half, third-year kicker Brandon Briggs from Saco, Maine completed a 40-yard field goal to put Maine on the board. It was his first career field goal. At the half, the Black Bears trailed the Dukes 7-3. The Dukes still led the Black Bears in rush yards (62-54) and total yards (186-114). JMU also led in pass yards, with 186. However, both teams were still tied at one turnover. On the opening possession of the third quarter, second-year running back Josh Mack rushed for 60 yards, leading to a Maine touchdown. Briggs then converted on the extra point, putting the Black Bears up 10-7. Mack had a successful freshman campaign. He was a Hero Sports FCS Freshman All-American Honourable Mention, Maine Co-Offensive Rookie of the Year and a winner of the New England Football Writers Gold Helmet Award. The Dukes answered back with a 22-yard touchdown pass from Schor to third-year wide receiver David Eldridge from Bealeton, Va., putting the Dukes up 14-10 with 9:12 left in the third quarter. James Madison converted again on a play from Schor to fourth-year running back Taylor Woods. Woods caught the ball and walked in for a nine-yard score. Gray then converted the extra point, ensuing the Dukes’ lead at 21-10. James Madison continued their momentum into the fourth quarter when Schor found first-year wide receiver Ezrah Archie for a three-yard touchdown to put the Dukes up 28-10 with 6:29 left in the game. Unfortunately, Maine came up short to James Madison, falling short in total, rush and pass yards. 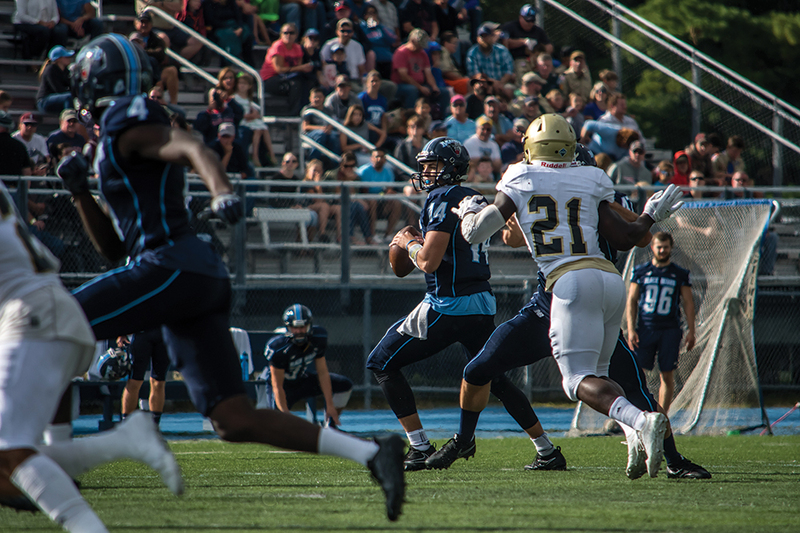 Maine returns to the field Oct. 7, when they travel to Philadelphia to take on Villanova University. Kickoff is scheduled for 1 p.m. James Madison returns to the field Sept. 30, when they travel to Newark, Del. to take on the University of Delaware. Kickoff is scheduled for 3:30 p.m.